The epoxy flooring jobs we’ve done in the Hamilton & Burlington regions vary from non skid finishes to decorative coatings to flooring solutions that are more natural and unique looking. 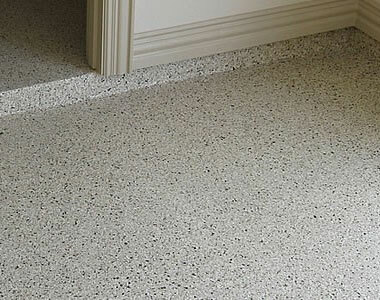 Seamless epoxy flooring systems that consist of colour quartz or vinyl flakes are becoming increasingly popular throughout Ontario. At Diamond Rock Concrete Solutions, we provide complete residential and commercial floor installations, repairs, and maintenance. 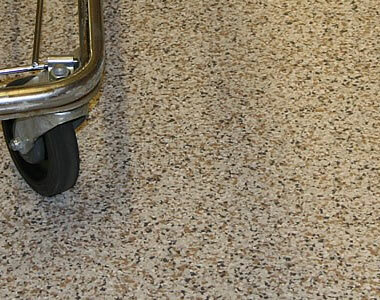 Epoxy flooring is a smart choice for protecting and beautifying your residential and commercial concrete floors. 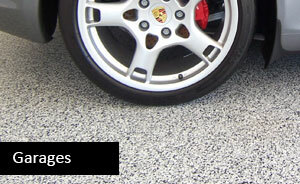 Done properly, epoxy floor finishes can last you well beyond 25 years with very little maintenance. Residential epoxy flooring uses in the Hamilton & Burlington regions have included full basements, patios, garage floors, and laundry rooms. Commercial epoxy flooring applications include a growing number of retail stores, local businesses, warehouses. Please view our Gallery for a sampling of our capabilities. At Diamond Rock, we enjoys turning bland concrete floors into attractive, durable, polished floors that require little maintenance. 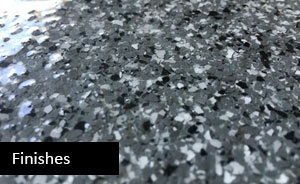 The floor finishes we apply are 100% Solid Epoxy Floor Coatings System, meaning they are extremely tough and resilient. Attractive – With a variety of colors and styles you have so many options including decorative patterns, flakes, glitters and much more. Maintenance – Epoxy floor coatings are easy to clean. Grease, dirt, dust wipe off easily as the surface is non porous. After contacting Diamond Rock, we always provide our customers with a free inspection of what needs to be done. Once we’ve been given the green light, we usually begin by repairing any areas of damaged concrete including cracks. Next, we use advanced grinding compounds and dust-free grinders to remove coatings and stains. The grinders diamond blades help remove pits and divots, leaving a finish that ensures maximum adhesion. 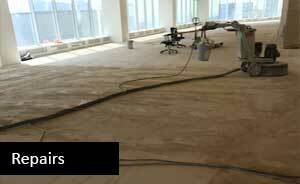 With the concrete floor now prepared, we then apply the desired materials and epoxy coating. With minimal maintenance, your new floor finish will last many years and add value to your property. Includes London, Brantford, Kitchener, Cambridge, Waterloo, Guelph, Hamilton, Oakville, St. Catharines, Niagara Falls, Stratford and all the smaller communities in between.